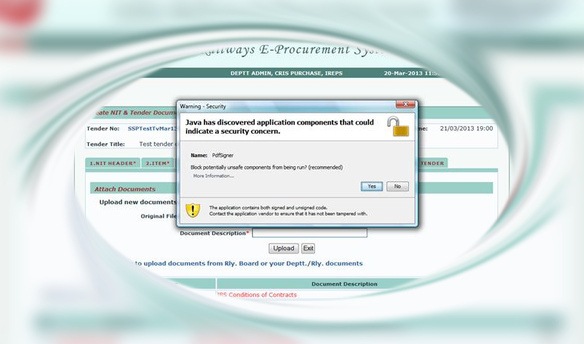 Second Pop-up Window: Showing the warning "Java has discovered application components that could indicate a security concern". Alert saying that 'Block potentially unsafe components from being run? (recommended)', but you need to click on No to upload the documents successfully. UNABLE TO UPLOAD DOCUMENTS. IE8 SETTINGS + JAVA ALL ARE WORKING AFTER A LONG TIME NOW SHOWING ERROR CODE 001, SAYING PLEASE REMOVE SPACES OR SPECIAL CHARACTERS IN PDF FILE NAME. PLEASE HELP ANY BODY. 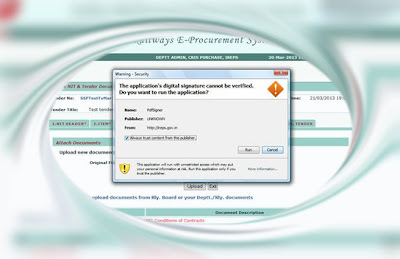 Remove the space or any special character from the PDF file name and you will be able to upload it successfully e.g file name TestDocument.pdf is correct while Test Document.pdf is not correct. 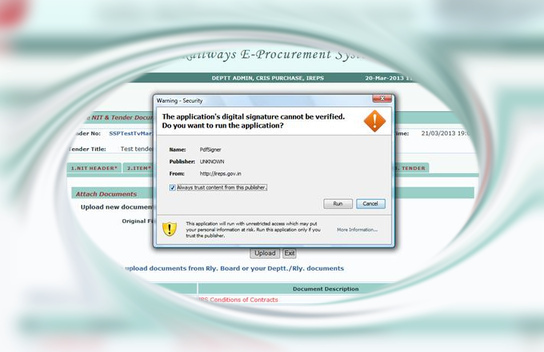 while uploading documents its showing error code -0 i am unable to find solutuion kindly any body help me to get the solution please. Were you able to find a solution? We are facing the same problem.